South Dakota State (21-9, 12-3): They are poised to repeat as champions of the Summit League, and Nate Wolters is trying to make history. Wolters is once again carrying the Jacks in chapter two of their cinderella story. His season reminds me a lot of Ben Woodside’s senior season at North Dakota State. That team had a real chance at immortality, but couldn’t climb over Kansas. The Jacks feel like that kind of team. They are not invincible, and have showed some weaknesses in the last two weeks, but we know that it would take a major upset to prevent this team from reaching their second straight NCAA Tournament and their first regular season title. Western Illinois (19-7, 11-3): Western Illinois continues to surprise everyone and is now on the brink of a 20-win season. They play an admittedly dull brand of basketball, but it’s been working, and they don’t seem to care who likes it, they want to get to the Dance, where they were just one possession away last season. Jim Molinari is a good coach with 20 NCAA and NIT tournament berths under his belt, and he’s done wonders with Western Illinois in the four years he’s been there. If South Dakota State doesn’t win this year, it will likely be because the Leathernecks suffocated them with their deliberate style of play. North Dakota State (20-8, 11-4): They started strong but have struggled to maintain that early edge they showed when they beat the Jacks at home. They are 4-7 since January 19, including two losses to Western Illinois, scoring just 36 points in one of those losses YMCA-stinkers. They are clearly the third team in this race, if not the fourth. Oakland (16-14, 10-5): Oakland is going the other way from North Dakota State, winning eight of ten games. Travis Bader is having a fantastic season, averaging 22.3 points per game. He’s been a truly underrated scorer who has been a key player for the Golden Grizzlies going all the way back to his freshman year in 2011 when Oakland nearly took down Texas in the NCAA Tournament. Oakland is a below-average talent with a good head coach. 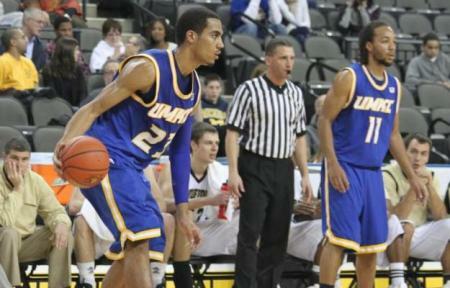 They could surprise some teams in the Summit League tournament. Omaha (11-18, 6-8): A positive season by Nebraska-Omaha, who you could argue is the fifth best team in the conference. Their record at the very least makes them the fifth best team. With that being said, it doesn’t make the Mavs a good basketball team. Not even mediocre. In fact, all six of their conference wins have come against terrible teams. They close out the season with back-to-back games against NDSU and SDSU. Justin Simmons has had a nice year (16.4 PPG, 4.0 RPG) and could get a nod for All-Summit second team honors. IPFW (14-16, 6-9): Frank Gaines has enjoyed a solid career at IPFW, and when all is all said and done, will probably have over 1,800 career points. All of that will be relatively unknown to the rest of the college basketball world because of where he played. There will always be very talented players in the Summit, but they are always going to be judged by what is around them. South Dakota (9-18, 4-10): Their sixth straight loss to start winding down the year pretty much doomed their season. Coyotes guard Juevol Myles has turned in some explosive games, averaging 15.3 points per game. I would expect him to be a strong candidate for Summit POY next season. Kansas City (7-22, 4-10): On second thought, maybe a move to the WAC isn’t so bad. They might be able to win some games for once. Despite playing in a great arena, and despite a desirable location and some competition from the high-major sharks swimming in the area, it baffles me how this team could never figure out how to recruit locally. IUPUI (6-23, 1-13): Their last win came on December 27 against IPFW, which was also their only conference win. 13 straight losses. Todd Howard has put in too much time and service to the program to be shown the door in just his second season, but IUPUI is a long, long way from the Ron Hunter era. Player of the Year: Nate Wolters, G, South Dakota State. Newcomer of the Year: Juevol Myles, G, South Dakota. Defensive Player Of The Year: Ceola Clark, F, Western Illinois. Coach Of The Year: Jim Molinari, Western Illinois. South Dakota at Western Illinois, March 2: If they win out, including one final home game against South Dakota, the Leathernecks can win the Summit League. Whoa. The Summit League Tournament, March 9-12– We’re just two weeks away from March Madness. The moment seems to have been lined up for SDSU, but I’m open to surprises. Unlike the regular season, the Summit League Tournament usually has some unforgettable games. Long shots playing hard for that distant dream. Thank you, automatic bid! This entry was posted on Thursday, February 28th, 2013 at 11:01 am by Brian Goodman	and is filed under checking in on, microsites, other 26. Tagged: frank gaines, ipfw, iupui, jim molinari, juevol myles, justin simmons, Nate Wolters, north dakota state, oakland, omaha, South Dakota, south dakota state, travis bader, umkc, western illinois. You can follow any responses to this entry through the RSS 2.0 feed. You can leave a response, or trackback from your own site.